Organizing and presenting your data in a logical and coherent manner is just as important as working with functions to analyze that data. 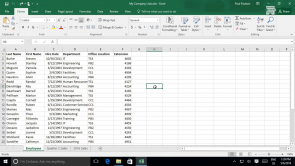 In this lesson, you will use Microsoft Office Excel 2016 to sort, filter, and subtotal data. These functions help you organize your data for better analysis and presentation.